Our skin is covered in tiny holes known as pores. When these pores become blocked, the sebaceous glands found at their roots start to over-produce an oily substance known as 'Sebum'. This excess Sebum mixes with dead skin cells, causing our pores to become completely clogged. This leads to the visible signs of acne with typical symptoms including raised red pimples and excess oil on facial skin. Of course, you can get acne in other places, the next most common being the upper back, sometimes called 'Bacne'. Acne can be triggered by a number of catalysts including poor diet, poor hygiene and hormonal changes, although it can often be hereditary. This means you are more likely to develop Acne if your parents have already had the condition. Increased levels of testosterone are also thought to be a trigger for Acne. This explains why the condition is so prevalent in males going through puberty. If you haven't yet heard about apple cider vinegar, be prepared for your life to change! This age old health remedy is made by fermenting alcoholic cider for a second time until there is no alcohol left, only vinegar. During this second fermentation process a strain of healthy bacteria is added that helps turn the sugars found in alcohol into a rich, mineral filled health tonic. This vinegar has been used for its medicinal benefits since the times of ancient Greece and is still used to this day in the treatment of hundreds of health conditions ranging from Arthritis to Acne. How can Apple Cider Vinegar help my Acne? A major component of apple cider vinegar is a natural substance known as Acetic acid. Acetic acid helps to unclog our oily pores and follicles whilst helping to restore the skins natural pH levels. Another great component of apple cider vinegar is Beta-Carotene. This powerful antioxidant is often included in commercial skin care products due to its ability to cleanse and reduce oils. Apple cider vinegar also has powerful antibacterial, anti-fungal and antiviral properties that help it to deal with any bad bacteria or other nasties that might be lurking on your skin. For this treatment we are going to make an even mix of ACV to water. Make sure to only use raw, unfiltered apple cider vinegar. The best thing to do is make enough to fill an empty bottle, this can then be stored in your refrigerator for use all week. Once your bottle is full, there is the option of adding essential oils such as tea tree or oregano oils, both of which can offer additional anti-bacterial properties. Next stage is to wash our face using a natural soap and exfoliating cloth. This helps to remove dead skin cells and surface oils. Once we have washed our face, it is time to break out the ACV. This can be done using a soft flannel or simply splashing the mixture over the face making sure to cover all affected areas. Rather than washing off the mixture it is best to allow it to dry on your face naturally for around five minutes. The smell might be a bit much at first, but as the ACV dries, it will start to fade. This process should be repeated once a day for around 4 weeks. Over this time the natural acids and antibacterial properties will help to reduce the visible signs of acne and your skin will return to a natural pH level. This treatment is for problem spots that require a fast acting solution. Simply add some neat, raw, ACV to a cotton pad and apply to the spot in question 4 times a day. This method will kill bacteria and help to speed up healing times, getting you ready for anything in no time at all. 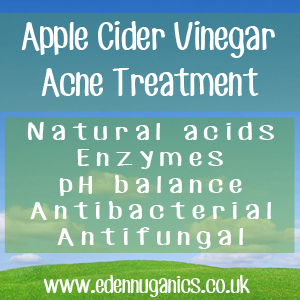 Apple cider vinegar can help treat acne from the inside as well as out. Simply including apple cider vinegar in your diet is known to offer benefits to our skin and overall health. Add two tablespoons of raw apple cider vinegar to an empty 8 ounce glass and fill with warm water. Honey can now be added to sweeten the taste of this somewhat tart tasting drink. We recommend Manuka honey as it offers additional health benefits. Drink this mixture every morning before breakfast for maximum benefit. Choosing the right type of apple cider vinegar is essential. Look for bottles that have a rich golden colour and a floating structure known as the mother. The mother is a sign of good quality apple cider vinegar and is responsible for many of its unique healing properties.